Contributor to The Best Australian Essays 2014. 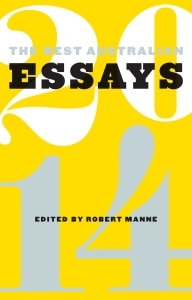 In The Best Australian Essays 2014, Robert Manne assembles his picks of contemporary non-fiction writing. This sharp collection of essays about the human condition evinces lucid insight, shrewd understanding and heartbreaking empathy. The Best Australian Essays 2014 will be released in November. Pre-order the print book from Readings or pre-order the eBook from Amazon or iBooks.